At least four people are being treated after having direct contact with a rabid raccoon in Hamilton. What is rabies?Rabies is a disease that affects animals nervous systems. Vaccinate cats and dogs. Supervise pets in areas near wild animals. Don’t treat wild animals as pets. Call Animal Services if you suspect a pet is sick. If a person is bit by an animal they suspect is sick, seek medical attention. Contact Public Health Services at 905-546-3570 if it’s believed there is a health risk from the animal. It all stems from a fight between two bullmastiffs and a raccoon — which later tested positive for rabies — inside a city animal services van. Paula Fancey, who owns the bullmastiffs named Lexus and Mr. Satan, said she received a call from the Ontario Ministry of Agriculture, Food and Rural Affairs (OMAFRA) Friday notifying her that the raccoon had rabies. Two of the four people being treated at this point are the two animal services workers, said Ken Leendertse, director of licensing and animal services for the city. Fancey said she and her daughter, Jordan, are also going to get the shots because they came in direct contact with the dogs. The rest of her family — her husband and two children, ages 13 and 16 — will go to their family doctor to be assessed to see if they require treatment as well, she said. The only people believed to have had direct contact with the sick animal are the workers, Fancey and her daughter, said associate medical officer of health Dr. Julie Emili. As of 7:30 p.m. Friday, Emili did not believe health officials had been in contact with those who called about the raccoon, but it’s possible they could be treated as well. 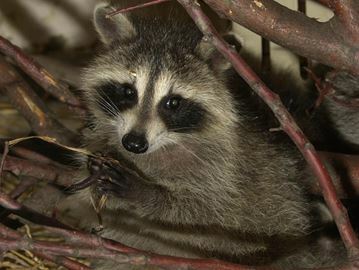 Animal services picked up the raccoon in Stoney Creek, Emili said. The dogs came in contact with the raccoon after they were picked up and placed in crates inside the city van when they were seen running loose in the neighbourhood around their Province Street North home. The raccoon was also inside the van and was being transported to the city’s animal shelter to be euthanized, city spokesperson Ann Lamanes previously said. Jordan, who was there at the time, said Lexus had scratches on his face, a split tongue and bloody marks inside the mouth after breaking free from the cage. Mr. Satan remained in the crate but had gouge marks on his chin and side, she noted. The city has said the department is reviewing protocols and equipment in vehicles since the incident. Moving forward, animal services was scheduled to pick up the two dogs from Fancey Friday night to hold them in quarantine for two days until next steps are determined. Fancey said her vet advised her the dogs will have to remain in quarantine for three to six months. She said she does not know if her dogs have been vaccinated against rabies. She’s going to take the weekend to mull over what she’ll do. She said she’s considering putting the dogs down because of the health risk. If anyone believes they had contact with the sick raccoon before it was picked up, they should contact 905-546-2489 after hours or 905-546-2424 ext. 3327 during business hours.